Vuukle, world’s fastest growing audience engagement tech company, had its first few clients amongst the biggest names in Indian online publishing. Today, after years of insane growth, we are excited to announce that Vuukle powers 4 out of top 5 Indian digital publishers. In all, over 250 million users are visiting web pages powered by Vuukle Audience Engagement every month. 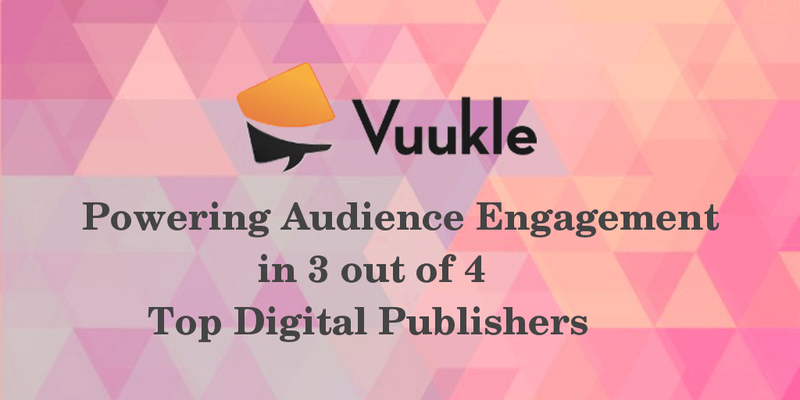 Of these, more than 45 million users actively engage with some Vuukle widget. Users have been commenting, recommending, rating, emoting, sharing or subscribing on Vuukle. If we pause for a moment and think, 250 million users make us bigger than any single digital media company in India. Which should not be surprising given that the biggest media company in the world today does not produce any content. And that is the direction where Vuukle is headed. We aspire to be the world’s biggest aggregator of vocal users. People who speak out their mind, people who want to be heard, people who are vocal (did you know the name Vuukle is a play on the word vocal!). What has been the reason behind such phenomenal product adoption? Why have the top digital publishers chosen to trust a media technology company with no background in digital media production? The answers lies in the changing landscapes of media technology, software development, cloud computing and AI. Couple this with the sheer challenges of dealing with humongous amounts of big data. Together these things have given rise to specialists in data crunching. In 2013, Vuukle was one of the first tech startups to graduate from the Microsoft startup accelerator program in Silicon Valley. With a cloud technology platform designed for scaling to millions of users on Day 1, Vuukle proved its early technology on some high traffic digital publishers. With time, Vuukle Audience Engagement added several widgets. The powerbar (used for sharing to social media) replaced other badly designed plugins with slow loading. The star rating and emote feature enabled the user to express how they feel about the story. Till date, this is the single most popular widget with more than 2 million unique interactions every month. However, the most profitable widget for our clients is the recommendation widget, dubbed “Talk of the Town”. This widget generates around 4 billion recommendations every month. Out of these, more than 10 million are clicked and contribute to increasing the average user session time. This metric, rather than the good old page views, is a more accurate indicator of a website’s revenue potential. Such impressive growth has not come without its fair share of failures and lessons. In the end, we are proud of our clients, the giants in Indian online publishing. They had faith in a new product and joined us in our mission to increasing user engagement on the wild wild web. Our recent partnership with Google has enabled us to bring the Perspective API which automatically measures the potential “toxicity” of a user comment and auto-moderates. This has liberated so many moderators from the monotony of comment moderation. The fight against ever shrinking user attention span has only just begun and we are committed for the long haul.